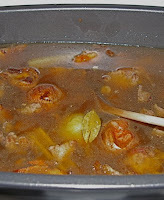 DID YOU NOTICE that all the beef bourguignon recipes call for beef stock? You just can't get that rich beef flavour without it. I know, you can now buy both chicken and beef stock in that awful Tetrapak packaging (do you know it's not recyclable? ), and it looks real enough. I mean, Rachael Ray uses it, and so do all the celebrity chefs on the food channel, so it must be good, right? It's okay, but in their own restaurant kitchens, real-life chefs have a helper who makes all the stocks, and there's a reason for it: it's much, much better than anything you can buy. Not to mention a lot cheaper, because it's made with scraps, leftovers and vegetables that are no longer fresh enough to serve, like limp carrots. In my own restaurants, we always made all our own stocks. AFTER my cross-rib roast shopping spree (the one that propulsed this whole blog), once I had the freezer stocked with 20 lbs of ground meat and 8 nice little pot roasts for four, I had all those lovely trimmings of fat, gristle and meat, so of course I made brown beef stock, (also known as beef broth, bouillon and consommé). You will see from these pictures how easy it is! Step 1. 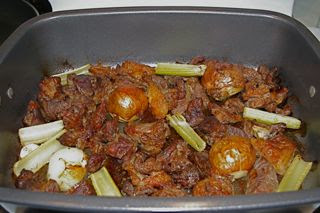 You need beef scraps, fat, gristle, (bones if you have any), a couple of unpeeled onions, halved, a couple of stalks of celery, halved, two cloves of garlic, unpeeled. Had I had some carrots around I would have added some (unpeeled, cut in two lengthwise and in two crosswise). Are you thinking, "Oh my, so much fat!"? Don't worry. It's only there for the flavour. Once the stock is done, all of it will be removed. I love using my big non-stick turkey roasting pan for this, because it's big enough to have everything in one layer, which is essential for proper browning. Step 2. 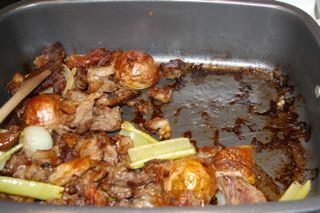 Place the roasting pan in a 450-degree (220°C) oven and roast until brown on top – check frequently. 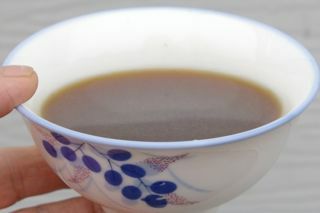 Stir and return to oven until everything is a deep brown but not burned. Push the ingredients aside: this is what the bottom should look like. This means that all the juices have caramelized enough. Take the pan out of the oven and turn the temperature down to 325 degrees (160°C). Step 3. 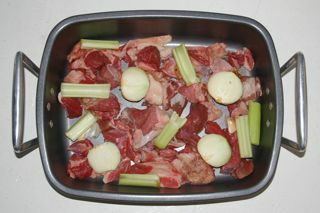 Now, pour in COLD water gradually, scraping the brown bits until they're completely incorporated. Pour more cold water until everything is covered, and a bit more. Add a sprinkling of thyme, two bay leaves, three peppercorns and two allspice berries (the latter is a secret I learned in Mexico). Step 4. 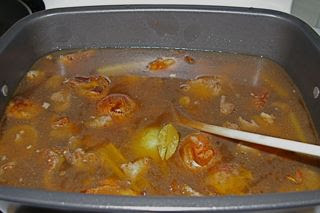 Bring to a boil on top of the stove, then place in 325-degree (160°C) for at least two hours. You could use the extra oven shelf for making a stew, roasting a chicken or baking potatoes. 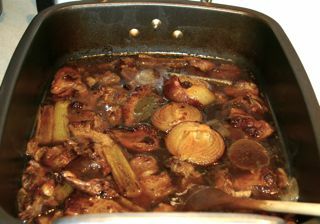 ALTERNATIVELY, you could transfer all the ingredients to a stock pot, scrape the brown bits from the bottom with water, pour those juices into the stock pot, add water to the stock pot to cover, and simmer the stock on top of the stove for at least two hours. Step 5. The stock is done. Note how much it has reduced: this is normal. Strain it through a fine sieve. 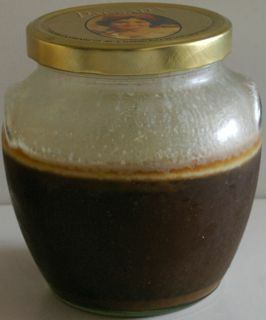 Transfer it to a clean container and refrigerate overnight. By the way, it's important to remove the fat; otherwise, the stock will not keep well. If you want a really clear stock, bring it to the boil and strain it again through a coffee filter or several layers of cheesecloth. At this point you have a beautiful, dark, fairly clear, but quite tasteless product. Heat up a small quantity, add salt, and taste it. If it tastes like you could use it as is – with a deep, beefy flavour – then it needs no further input. If it's tasteless even after adding enough salt, you may have added too much water. Put it back on the stove and reduce it somewhat. Whatever you do, do not season it before storing it. If you're used to bouillon cubes, you'll find yourself adding more salt to your dishes than usual, but when you don't want the extra salt, it won't be there. So, apart from Beef Bourguignon, what would you make with your own home-made stock?